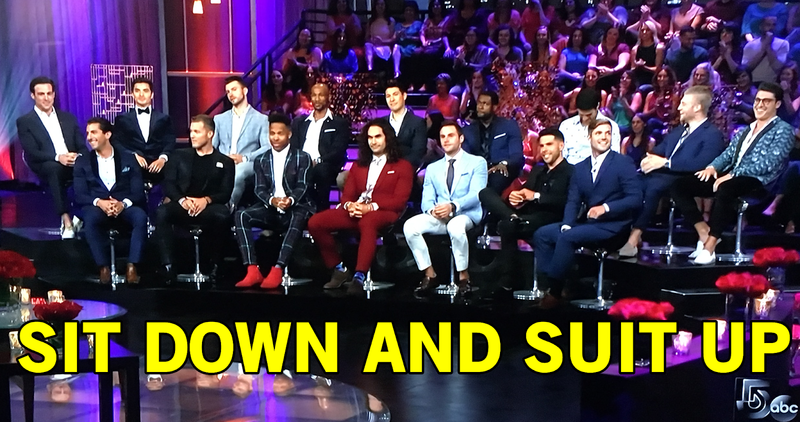 Becca's rejected men take the stage to yell at each other for one last bit of airtime (until half the cast is on Bachelor in Paradise in two weeks). Instead of paragraphs, I'm giving you bullet points because recapping the Men Tell All special is always a mess and I consider it a chore but I still love you readers, so I still recap. Jordan is the center of anything and everything, bickering with everyone (except his man Grocery Joe) and using fantastical phrases to boast about himself, which are next level clever. There's also fighting over the level of model David is compared to the other guys who are models too. Jordan is quick on the comeback and since he's overly confident and funny he realizes this rubbed the guys the wrong way. Jordan is wearing the gold hot pants. The guys thought Jordan's main antagonist David was much more focused on hating Jordan than giving Becca attention. Jean Blanc claims he was falling for Becca, but Colton and the other men think it was all BS and ruined the L-word for the other men by cheapening it for attention. He later apologizes to Becca for pulling this move and gifts her a new fragrance that he's not going to take back. Grocery Joe was eliminated night one but gets to sit in the hot seat because he captured our hearts. He's so popular I'm still holding on to the hope he'll be the next Bachelor should Bachelor in Paradise not pan out for him. Wills lives his stylish life to the fullest in a dark green plaid suit. Colton is very morose about being dumped by Becca, partially because of Tia. A very hard part of this experience also was revealing his virginity on TV after lying to cover up his shame, so when Jean Blanc insulted him during the reunion about this it was still painful. Jason cries seeing himself get dumped again. Jason's mom sends the vomit emoji every time Becca says he's a good kisser. Becca was going to dump Colton regardless of Tia's revelation of feelings. Chris apologizes to Becca and brings out a gospel choir to sing his apologies. People love bloopers and there are some pretty great ones that actually made me laugh out loud. Well, we survived the Men Tell All and we're one week away from finding out who Becca will choose. See you then!